Pantomime Corporation today demonstrated the first software that lets users of virtual reality headsets play together in 3D worlds over WiFi networks, using a smart phone or tablet to reach in. 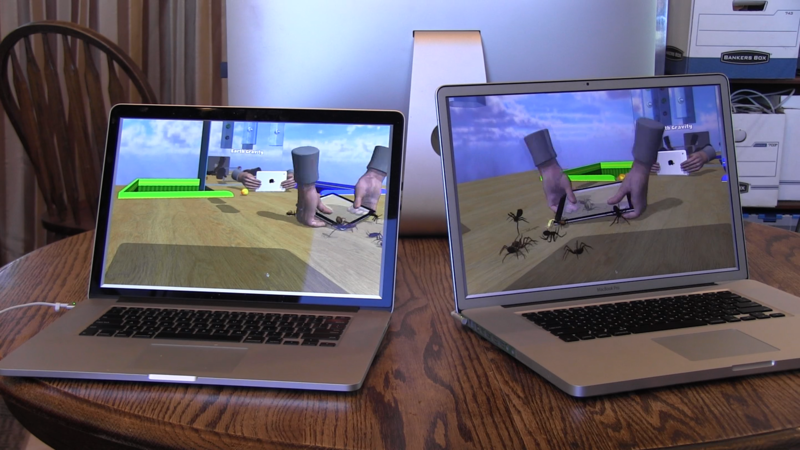 Pantomime software turns virtual reality from a passive solo experience into an interactive, social one. Anyone can reach in, and headsets are optional. At today's AR/VR Vision Summit, Pantomime Corporation demonstrated the first software that lets users of virtual reality headsets play together in 3D worlds over WiFi networks, using a smart phone or tablet to reach in. Users see the devices they are really handling, in animated virtual hands, through the immersive stereo display. Multiple users see each others' virtual heads, hands, devices, and the physically realistic objects they're all interacting with, in a new kind of augmented reality. In December Pantomime introduced cross-platform software for iOS and Mac for reaching and seeing into virtual worlds with phones and tablets as well as computer screens. FastCompany wrote, "it has a great deal of promise, especially once the technology is available for the Gear VR and other VR hardware." Said futurist Robert Scoble, "It's the gateway drug for VR." Today at the AR/VR Vision Summit in Hollywood, the company demonstrated multiple users of the Samsung Gear VR headset playing in shared virtual worlds and reaching in to interact, using ordinary consumer smartphones and tablets. 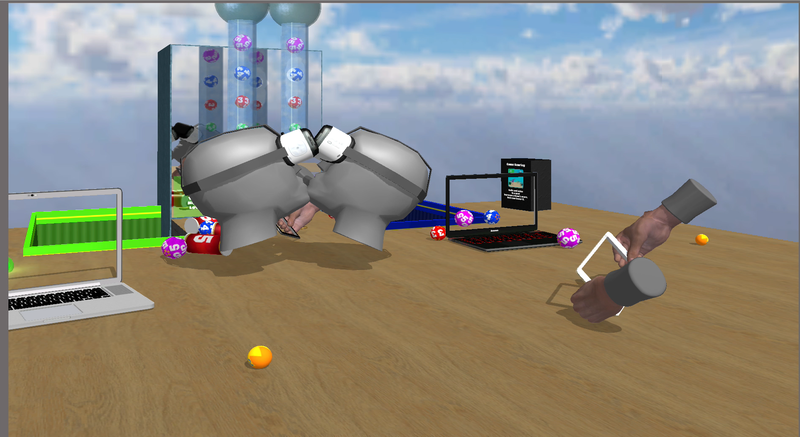 A half dozen virtual worlds showed how users can push and paddle balls and other realistic objects, knock over dominos, play scoring games, dance together with expressive body language, and squash virtual bugs against their real tables, while seeing virtual versions of the devices they're really holding – held in their animated virtual hands. In most modern VR systems, users don’t have hands. They can’t reach into worlds in 3D and interact; instead they look around at recorded 3D content from a fixed location in the virtual world. The Gear VR includes a touch pad on the user's temple that can be stroked or tapped to shoot at targets or operate menus. Hardware solutions to allow reaching in, for the far more expensive, unreleased Oculus Rift and HTC Vive, have been announced for later this year, with no known price. In contrast, Pantomime's patented motion tracking software turns ordinary consumer tablets and smart phones into fast, accurate, wirelessly networked mobile 3D paddles – adding interactivity and virtual hands to mobile VR/AR headsets at no hardware cost. These are shown in videos and photos included in today's announcement. All of these can be incrementally expanded, such as adding additional headsets, mobile devices, and computers to a live scene. Early virtual reality has been dominated by head-mounted stereo displays for a single user. This kind of "immersive" surround is achieved by covering the user's face with a display that hides the people and the devices around us. Pantomime takes a fundamentally expanded view of immersive 3D and virtual reality, effectively turning it inside out by embracing the devices and screens consumers are surrounded with every day, and incorporating them into the 3D scene in a new kind of augmented reality, so users can see multiple views of physically realistic world on shared screens, any consumer can join in, and headsets are optional.